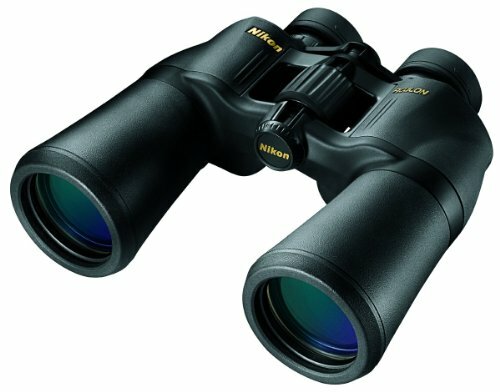 The 8248 ACULON A211 by Nikon is a perfect example of the kind of binoculars you need. They don’t cost too much, given their great quality, and offer all the features necessary to make using them a great experience. They have a good set of 10x50mm lenses. This is important because they ensure a reasonably wide range of view, and make it possible to move your eyes slightly without distorting the image. This helps with the image stabilization when viewing landscapes and allows you to use them for extended amounts of time with ease. The lenses also allow more light to pass through, which means they’re great for using in in low light times, such as dawn or dusk. The excellent ‘turn and slide’ rubber eyecups make long period uses easier too. The lenses are multicoated, which makes them give more clarity and brightness. Furthermore, the focus knob is placed in the center to ease the process of focusing onto your targets. 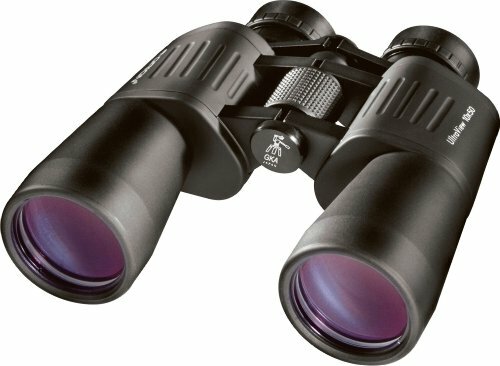 The binos come with rubber coating which make gripping it firmly a breeze, even it rainy weather. The coating helps minimize the damage if you accidently drop it, however, this feature can be found in most good quality items. This pair is a pretty simple and good choice for anyone who wants a dependable product that works well and provides them with basic functionality. The next product is the 09351 UltraView by Orion. Somewhat pricier than the Aculon A211, this item also makes for a great buy. The lenses are similar, sized at 10x50mm, which is a great size for looking at wide areas and magnifying little details at great distances. The eyecups can be used by glass wearers, which is an added advantage. This product also takes pride in its body which is made of a cast metal alloy. The image formed by the optics is clear and sharp due to the lenses being finely ground and coated. The colors are bright and the image has great contrast too. Like the Aculon, the focus wheel is at the center and can be easily reached with the fingertip while using the binoculars. Mostly, 10x50mm models can be quite heavy in comparison to their smaller lens counterparts, but this product maintains a comfortable weight, which is great if you want to keep it with you on long journeys and enables holding it for long periods of time while using the viewing over the landscape. This product is recommended if you’re a glass wearer as it will make your life all the more easier for the extra price it charges. For non-glass wearers, the Aculon is, perhaps, the best binoculars choice as it gives almost all the features the UltraView does, but at a lower price.